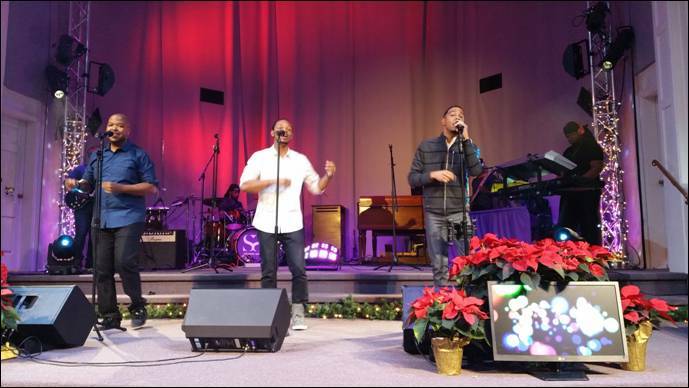 Stellar and Dove Award nominated singing sensation all male group, GI also known as God’s Image recently returned center stage for their annual Christmas Concert after a three year hiatus. The group has been busy building, teaching, speaking, preaching and most recently recording and working on their next project. But with the nearing of the finish project in sight, group members Brandon Anderson, LaMonte Harris and newest group member Rufus Johnson thought it was time to return to the center stage in addition to sharing a few of their soon to be released new tunes. With a packed house, it was clear that many agreed as well, will all roads leading to Spirit Speaking Ministries on Saturday evening to help celebrate their return. Their special guests for the evening included the New Generation International Praise Team, Anointed Expression Mime Ministry out of Chief Cornerstone Baptist Church in Goochland, VA, Christian Bolar, an 8 year old singing sensation and also the great-grandson of Lonnie Liston Smith Sr., of The World’s Famous Harmonizing Four and nephew of Lonnie Listen Smith, Jazz musician. Also performing was T-Soul who performed songs from his latest release Music Unplugged. Just before the group was introduced, the emcee for the evening, Sheilah Belle, The Belle, opened the floor up for testimonies. Three individuals shared their trials and triumphs including Reggie B of Program Director of Praise Radio One Richmond. With his wife and sons only a few rows away, he shared his testimony about his doctor first telling him that he had cancer, his fight, determination and faith to over come it, and how God has delivered him from it. “On my last visit to see my doctor, he said, things are looking good…I’ll see you in two years,” says Reggie. The crowd erupted into applause with emotion also visible on Reggie. Truly a strong testimony.